To kick off the first in an occasional series of interviews with people in the world of airguns, shotguns, archery and outdoor gear, we talk to the director of Pellpax, Darren Kirk. 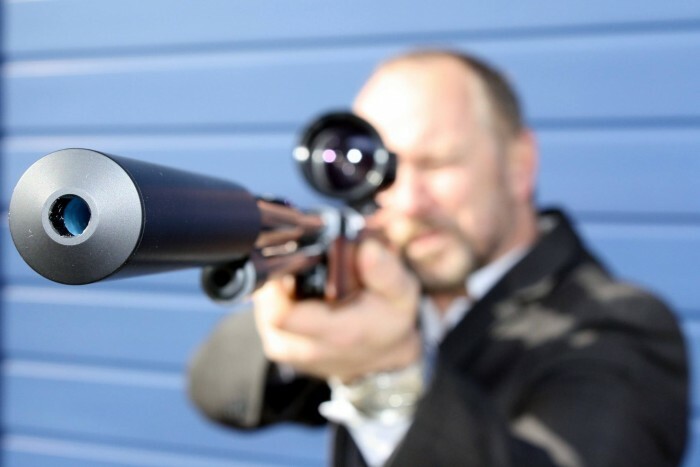 A dynamic leader who has turned this online business into a multi million pound organisation within two years, Darren has his sights on making it the biggest player in the airgun market. We chatted to him to find out more. You’re running an airguns website right now, but what’s your background? My background is actually IT: sixteen years as IT manager for Dupont. It was older technology – way older technology. I’m a certified Novell Engineer, but nobody uses Novell anymore! When I left that job it was early days of Windows, and very early days of anything Internet related. We had wide area networks – nothing like there is today, of course – but even in those early days I realised the power of IT, especially in a business like ours, where we’re a warehousing and online business, and the website is effectively our shop front. That’s where we need to invest the money. Whereas other people would invest it in infrastructure – things like dummies and shop windows and displays – our shop front is the whole of our website. What’s a typical ‘day in the life’ for you, as the director of Pellpax? Each day I do some work to keep control of the finances, sorting out things like who gets paid when, so in that sense, I keep a very tight control on the purse strings. We’ve got so many projects on the go at the moment, and we can’t bring them through as quickly as we’d like, so it’s just a matter of spending a little time on each project, trying to move it forward. Then there’s a lot of day-to-day stuff like paperwork and so on. It’s so easy to get diverted, and then at other times you just get held back. It can be really time consuming. For example, at the moment I have 1018 unread emails! I scan through them, pick out the most important ones, and reply to them. And whenever I get time, I start from the oldest ones and work my way forward – which is not a good place to be. It’s just that there aren’t enough hours in the day to physically do everything at the moment. How has Pellpax grown in the past few years? It seems to have experienced a rapid period of growth. It’s actually been only two years. The current website went live on Feb 13 2014, so we traded for six months on a different website. The biggest achievement is that we’ve achieved that growth without borrowing any money. Everything is paid for. All our stock is paid for upfront. We pay our suppliers pre delivery, before we get our products in. That’s the biggest challenge: juggling the money. You want to be sure you’re safe in the bank for anything that happens, but at the same time you don’t want to be holding back too much money and stopping the business from growing. It’s quite challenging at times. It’s a juggling act, but we’ve managed to keep the balls in the air so far – and without needing any financial help from anybody. Tell us about the type of customers you get. We do have two main types of customers. One group is the professionals or the ones who are seriously into their shooting. We have people working here who are very knowledgeable and know what they’re talking about. We’ve got three gunsmiths on site. We’ve got a guy who has three British archery records. We’ve got a guy whose business is hunting, managing deer herds, and game keeping. So we’ve got the in-house expertise in all the areas our customers are interested in. But then we do have a large number of customers who are first time buyers. Or maybe they’re retired, and they had an air rifle as a child, and they’ve got a bit of spare time and a bit of spare money. Our experts have to look after these customers in a different way. So we have two ends of the spectrum: people who really know what they’re on about and what they’re looking for, and people who have no idea beyond a budget and a rough idea of what they’re going to use it for! We don’t always sell people the most expensive gun or the item we can make most profit from. If they say, ‘we want to use it for pest control’ or ‘we want to use it for target practice’, we do advise them, and they end up with a product that’s most suitable for the purpose. So really, the level of qualifications, knowledge and expertise in the staff team is a big advantage for us. Tell us about Pellpax’s unique delivery service. We have our own fleet of five vans, and occasionally we’ll hire an extra one if we need it. They’re all caged and high security, with cameras and lights inside. We have two full-time drivers, who go out every weekend, and then we have a bank of seven ex-policemen – drivers that we pool from, depending on how many we need. Most of them are former fire officers and ex-marines. They know the guns anyway, and they’re used to dealing with people in difficult situations. So we take the security very seriously. We try and give as good a service as possible. When you’re planning routes that cover the whole of the country, it’s very difficult to be at a certain person’s house at a certain time with no room for error. There’s always going to be traffic problems or whatever. But we do achieve over 95% hit rate on getting to the door at the time we told the customer we’d be there. A couple of things that have happened over the last few months: we’ve had our explosives licence through, so we can deliver powders and ammunition, and if we turned our hand to it, even fireworks too; but we also do quite a lot of canoe deliveries, believe it or not. It’s really expensive to courier a 15-foot canoe anywhere, but our vans are going everywhere every weekend anyway, so it’s very easy to strap one onto the roof. We’ve got a canoe trailer too, and we can tow that. So we’re making a fair impact on the canoe business at the moment! It seems like there’s a lot of innovation in the business. How important to you is trying new things? I think, in a lot of businesses, if you stand still, you’re actually going backwards, because other people are coming along and doing things bigger and better and faster than you are. So there’s no room to stand still. We’re constantly moving ahead, looking for new suppliers, looking for new products, investing money in improving the website, investing the money in doing the email marketing and blogs and facebook and twitter, and all the other things we’re doing at the moment. A lot of it is going to take years before we become big players with some of those products, but the whole point as far as I’m concerned is that if people are searching for something, and they end up at your website, they’ll then see what other products you supply. You might just get somebody coming along for a boat box, for example – a Dragons’ Den boat box – and they come onto our website, and they’re into their shooting. And they might never have found us if it hadn’t been for some relatively obscure product they were searching for. We’ve got the development of the show trailer at the moment, with an idea that next year we’ll be at a lot of shows. The base is on order and the first money has gone to the carpenter who’s building this thing for us. So the emphasis isn’t just on new products and how we expand the range, but also on how we get those products in front of potential customers, either electronically or physically. Finally, tell us about the new warehouse plans that are underway. Yes, we broke ground about eight weeks ago now, and we’ve got a new warehouse that will be split into three sections. One will be a small retail unit, and then there’ll be the main warehouse to one side of it and a further warehouse, for bulk product, on the other side. So the three units that are being built are in total well over three times the space we’ve got at the moment. And there will be a full-length archery and gun range built down the back of them. So, customers will be able to come along and look through what we’ve got in the retail unit shop, and if it’s not there, we’ve got the warehouse next door, and we’ll be able to fetch something off the shelf for them to look at. And if they’re seriously interested, they can go down into the range to test fire the guns before they buy. With exciting times ahead at Pellpax, stay tuned for announcements on the blog, or sign up for our regular emails for news, features, and info on the latest products in our range. Next Post » Next post: How Can I Get A Shotgun Licence?